Sweet Feet Dance | Discovering Sole to Soul Connection Through Dance! Discovering Sole to Soul Connection Through Dance! Professional Dance Instruction for Adults in a Fun and Encouraging Environment Since 1993! Sweet Feet Dance provides top training where adult students gain poise and strength while building skill level and confidence. All instructors are trained to educate, motivate, and enrich lives. 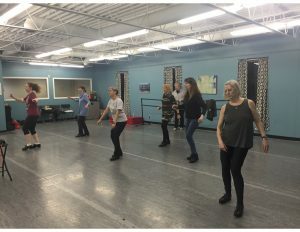 Sweet Feet Dance offers adult tap and jazz classes that focus on proper technique, terminology, and body awareness in an atmosphere of creativity, high energy, and fun! Sweet Feet is the go to studio for multi-level tap classes and progressive learning. Click here to read about all of the benefits of tap dancing. Click here to read about how dancing can reverse the signs of aging in the brain. Check out the video below to learn about how dancing improves brain function. Dancing improves brain function and reverses signs of aging.